On Easter Sunday 2001 the relics of St. Therese – a small casket containing a thighbone and foot bone – at the start of an eleven-week pilgrimage. Among those who turned out for the event was Don Mullan, a bestselling Irish author and media producer. Mullan had mixed feelings about the whole affair. Advanced publicity for the relic tour had promised the arrival of an anonymous “she” who would be bigger than U2 and draw larger crowds than Madonna. When the “she” turned out to be the bones of a nineteenth-century saint, Mullan and others wondered if the organisers had lost their minds. They were predicting that a million people might come out to see the reliquary as it made its way across the country. As it turned out, the reliquary drew nearly three million people. And Mullan, who from childhood had a deep interest in St. Therese, was so impressed that he decided to do a book about those who came to pray before her earthly remains. The tour attracted devotees, of course, but also doubters and cynics, many of whom found themselves nevertheless strangely and profoundly moved. More than one hundred of them submitted their personal accounts and reflections. 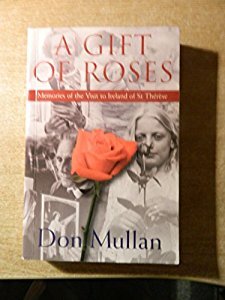 The resulting book, A Gift of Roses, disoriented Mullan’s previous readers. “I was gaining a reputation of a hard-nosed and impactful investigative journalist. Then I do a respectful book about a box of bones, and some saw me as losing my marbles,” he said. What struck Mullan was not only the size of the crowds who came to see the relics but also the atmosphere of prayerful reverence. There was no triumphalism about this relic tour, he explained, no “bishop bandwagons” to proclaim victory over secularism – only thousands of people, whether the elderly, middle-aged couples, teenagers or young children, lining up to pay their quiet respect. They would wait for hours, often in pouring rain or cold wind, in order to stand in front of Therese’s reliquary for a few seconds. For many of them, St. Therese was a figure planted in their spiritual memory by their mothers. From ‘The Vatican Prophecies: Investigating Supernatural Signs, Apparitions, and miracles in the Modern Age’, by John Thavis (New York Times bestselling author of ‘The Vatican Diaries’); Viking, New York, 2015.